I really like this book, it is a good mix of action, adventure and history and tells me to a certain extent on what went on in Britain during the war and how families dealt with it and threats they might face and difficulties. My favourite parts of the book are when Lee and Appy find new information and use it to further find out and stop the assassination. I kind of feel involved in their achievement and can relate to it. I would like to see a bit more drama as for example, I didn't really feel angry when Plato betrayed Lee, or any other emotions at all. I would give this book 4.5 stars out of 5. This book I have read is 'Conkers and Grenades' by Hilary Lee-Corbin. The genre of this text is Historical adventure. 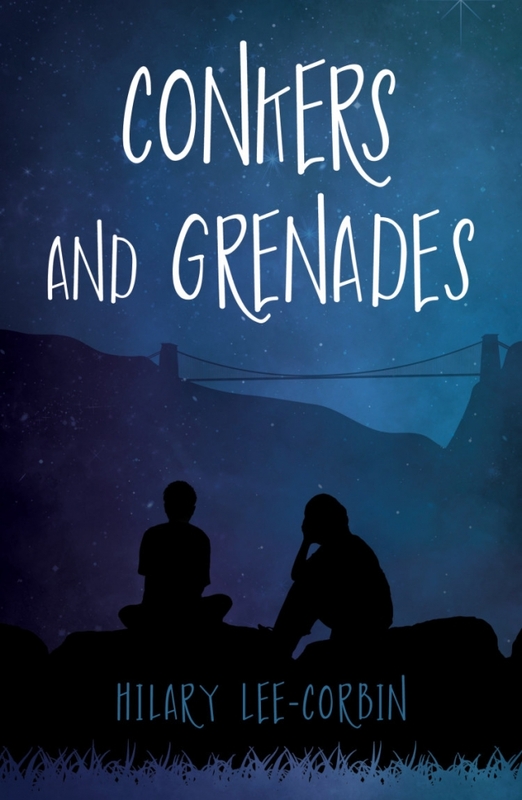 Conkers and Grenades is a thrilling historical novel set 1916 Bristol. The story is told by one of two school boys, Maurice Lee, who over hears a German conversation. The plot then develops into a surprising chain of events featuring unexpected characters, which is one of the factors that makes this novel such a page turner. Towards the middle of the book the plot unfolds as we learn about a group of spies planning an attack, at this point we are still not sure what, but this is the job of the two school boys who are employed by their headmaster to find out. The novel comes to a satisfying end when we find out a plan to assassinate the King and Queen on their royal visit to Bristol. What can two school boys do to save the country. Maurice is the narrator of the story, so our views of the characters are probably a bit biased. For example, Appy is portrayed as a slightly dopy but surprising clever boy, whereas Socrates remains a riddle throughout the story as if in real life. What makes Plato an interesting man is the way we suddenly find out who he really is late on in the novel . He remains a friendly, likable character until the penultimate chapter of the book, where a shocking truth is revealed. Personally, the setting of Bristol was a relatable choice. Therefore I found it is very easy to picture the different areas, which really helped in following the story. Also, the author uses great descriptions of places, often referring to the 'magnificent' and 'towering' Clifton suspension bridge above the river Avon. However, I find the Author doesn't actually describe the 1900s era very well, half the time I found myself picturing maybe even the 1950s, so I think that it is an important point. Overall I have really enjoyed reading this book. It had a brilliant plot with interesting and engaging characters. The description was excellent, which builds up a clear picture of the setting and characters. I would recommend this book to boys of around 12-16 who are looking for an exciting, realistic adventure novel because of its unique plot and engaging situations. Hilary Lee-Corbin's latest novel incorporates suspense, thriller and adventure to produce a general portrait on the harsh reality during The Great War in Bristol; an important port city in Britain. Set in Bristol in 1916, in a world plunged into war, Conkers and Grenades follows Mar and Appy. Two boys who discover a spy ring and a plot to assassinate the King and Queen. The story follows Maurice Lee, known as 'Mar' and George Whitfield, known as 'Appy' - short for 'Happy' - in honour of his great cheerfulness, on a journey of danger and uncertainty. The two young boys become entangled in a web of secret agents, codes and danger when trying to help the war effort. They are constantly pre-judged because of their working class backgrounds, but, Lee-Corbin highlights how unjust this is, given their heroic contributions. From reading the book, we are also given a clear idea on how much women struggled at home while their husbands fought abroad: they held down several jobs to cope with shortages of food and illness such as diphtheria. Mar and Appy face many challenges which they must overcome in order to save the King and Queen from being assassinated. Hilary Lee-Corbin writes with flair to create a novel that binds the background seamlessly into the narrative. Although the book is fiction, the historical background is still accurate and we realise that it is not just the men who helped the war effort; but, women and children too. Lee-Corbin does not modernise ideas and the language used, particularly in direct speech, is just as it would be in early 20th Century Bristol. As you read the book, you can receive a connection with the storyline and feel as though you are experiencing the same adventure that each character goes on. It is jam-packed with plot twists that gives it a real excitement about it, and, although it is an obvious ending, we discover the answers to each question gradually as though we are solving it ourselves. After reading Conkers And Grenades, we can gain a real understanding of World War One and the impact it had on the people who experienced it. I would highly recommend this book to anyone who enjoys to read an adventure story based on historical events. I really enjoyed the book 'Conkers and Grenades'. I found that it taught me a lot of facts and also had a very interesting story line. The particular bit that I liked most was when Mar and Appy (the main characters) first hear three suspicious characters planning something. However, I don;t think that it was very realistic as I can't really imagine two young boys coming across such a big plot and so much danger. The book did make me want to find out more about this as I did find it extremely interesting and I really liked the story line. The book did want to make me read more from this author as I loved the way the story was told. It used great vocabulary that could really make you picture it in your head. I found it really affective as the story would often have something you didn't see coming. It did make you want to read more of the book. It was also quite a short book which to me was affective as it never dragged on for ages about the same thing. I really liked Conkers and Grenades. It was a funny, thrilling insight to what it must've been like to be a child in the midst of World War One. I liked, in particular, the character of Appy. He is a happy boy, full of excitement and jokes. I also liked the part when Maurice escapes from the Hawk and his group of spies. It made me want to go and find out more about civilian life during WWI. The book did not, though make me want to read more by Hilary Lee-Corbin. The book I was reading is called 'Conkers and Grenades' by Hilary Lee-Corbin. I really enjoyed the book as it was exciting and interesting. I thought the history was accurate but this topic is something I don't know much about and would like to know more about. My favourite character was Maurice - 'Mar' - Lee as I found his attitude quite relatable and when in danger, he didn't run away, he fought. Even if he wasn't sure what to do, he would use his logic and find a solution. I also liked the way the book started and ended in a different time frame. It was quite confusing at first but once you start to read the book in context it makes a lot more sense. I really enjoyed this book and would recommend it to anyone who likes the world wars or anything to do with spies. This book is a good read. It is based in WWI and is about a grandfather telling his grandson his story. The story is about Mar and Appy, two best friends sighting spies. It follows the adventure they go on and is a thrilling tale. It opens my eyes on how people used to tlak and think. Not only does it contain history, adventure but also friendship. Appy and Mar stuck by each other and their family through everything. Taking you on a ride back through time it makes you want to laugh, cry or jump. The book was a good read and was a book I struggled to put down as I wanted to continue reading. In the future I would like to read more books by this author and I would highly recommend the book to anyone looking for a historical fiction that is also fun and not too long. I really like this book because it bought me back to the olden days. This book has many contexts. Conkers and Grenades have suspicious things happening to surprise the reader and keep them involved in the book. This book gives us two characters: Happy and Sunny. Happy is a boy who always wants to get into trouble; Sunny is a boy, who does not want to get in trouble. Happy and Sunny are best friends and trouble begins to happen like Sunny's sister (Isabelle) gets ill and they find trouble by a bomb. This is just not the end, their hard work also begins by joining an agent company. I think the History Book was realistic because it had many context links back to the war time. This makes the reader want to know more and research more about what happened at that time. Conkers and Grenades is a book all about adventure and keeps you on the edge of your seat. Set in Bristol in 1916, the book follows two boys, Maurice and George [known to each other as Mar and Appy]. They are suddenly involved in a spy group and a plot to assassinate the king and queen. I believe this is an excellent book. I think that the story has been very well written by Lee-Corbin and she has told a very interesting tale. The history elements inside this book almost mirrors what really happened back in 1916. But, I also think that some areas in this book need to be reviewed and thought about again. The story line seemed to go quite fast and 'jumped time' a bit. Some elements also seemed quite unrealistic. Some of the dialogue is also a bit unrealistic and a bit modern. Considering this was in 1916, some of the dialogue is a bit 'slang'. Although I have stated these cons, I believe there is a reason for some of them. One of the reasons is that the book is aimed at children and that some of the language used in the early 1900s, is too complicated for some children. Also, they could get the wrong impression of the story if some modern elements were not used. I would recommend this book to be aimed at 9-15 year olds.